Pythons, whether large or small, tend to be somewhat similar in their captive requirements and behaviors, and many have long been bred and studied. Two species, however, break all python stereotypes and are poorly understood – the Calabar Ground or African Burrowing Python, Calabaria reinhardtii, and the New World or Mexican Dwarf Python, Loxocemus bicolor. Both species are rather small, and so can be kept in spacious naturalistic terrariums where they might reveal more of their secrets to observant keepers. They live largely below ground, but forage on the surface after dark. Often compared to the Sand Boa, taxonomists are unsure of this species’ closest relatives. The head and tail are nearly indistinguishable – when threatened it curls into a ball and waves the tail about to direct attacks there, and away from the head. It is well adapted to life below ground, having smooth body scales, an upturned rostral scale on the snout and tiny eyes. Unlike other pythons, it lacks heat-sensing pits along the jaw. Calabar Ground Pythons are found in west and central Africa, from Sierra Leone east through Nigeria to Congo and Gabon. They inhabit loose, moist soil and leaf litter in rainforests, marshes and along the edges of farms. Some populations routinely shelter in termite nests. Calabar Ground Pythons do well in a thick substrate of shredded bark and leaf mulch. The substrate should be misted heavily each day, but should not remain wet. Cork bark should be provided as an above-ground hiding spot. Those I’ve kept fed well upon pink mice and rat pups. Several keepers report that adult mice and other furred prey is often rejected. This makes sense, as wild individuals likely raid rodent nests and may take burrowing lizards and amphibians as well. Females produce 1-5 very large eggs and, unlike other pythons, do not incubate the clutch. Upon first viewing a huge shipment of New World Pythons at an animal dealer’s facility years ago, I was confused. All had a burrower’s typical cylindrical body, but their colors and patterns varied so much that I thought perhaps several species were present. But such variety is typical, and enhanced by the ever-changing iridescence they exhibit in certain light. For now, Mexican Dwarf Pythons are the sole representative of their family in the New World. Some herpetologists consider them to be more closely related to the Sunbeam Snake, Xenopeltis unicolor, and, confusingly, they are sometimes sold under that name. Currently they are classified in their own subfamily, within the super family Pythonidea. The common name is somewhat misleading, as these shy burrowers actually are found not only in Mexico but also in Guatemala, Honduras, El Salvador, Nicaragua and Costa Rica. They share many of the Calabar Ground Python’s adaptations to life below ground, and are also nocturnal. In the wild, Mexican Dwarf Pythons inhabit loose, sandy soil and leaf litter, and often shelter below fallen trees (please see photo). They apparently spend a good deal of time foraging in rodent burrows, and have even been seen to enter iguana and sea turtle nests to prey upon eggs. 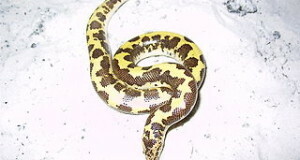 Mexican Dwarf Pythons can be kept as has been described for Calabar Ground Pythons, but need a drier substrate and less misting. A shredded bark – sand mix suits them well. Night-viewing bulbs are indispensible in observing them after dark, when they may forage above-ground. Given their lifestyle, wild Mexican Dwarf Pythons likely take more nestling rodents, eggs and lizards than adult rodents. Therefore, I prefer pink mice and rat pups as food, but others have reported success using adult rodents. Males are said to fight viciously, and should not be housed together. Very little is known about this unique snake. Some important reference papers and books are listed here. I am almost ready to capture breeding my spotted turtles next year, but I don’t know how to set up a great enviroment for the breeding. Can you help me or give me some advice? I am concerning about the ingredients of the sand and how to keep the sand’s humidity suitable for breeding. I had taken some photos about the turtle tank set up on my Facebook, but not sure it is sutable for breeding. I will get another tank to saperate male and female turtles when it is not the breeding season. Nice to hear from you again. The habitat looked good as far as I could see….they like shallow water and lots of cover. Easiest way to provide egg-deposition site is to position a large plastic container within habitat, if possible. Cut an access door in side, fit with a ramp if needed so they can enter easily. A mix of sand and topsoil, 4-6 inches deep, is fine (you’ll be removing the eggs for incubation in any event – hard to do in tank). Keep soil slightly damp, a small light above one area may draw gravid females. Gravid females become restless, may dig – may need to be placed in larger soil filled enclosure if they do not lay in regular quarters. Please see this article for info on incubating the eggs (the 1:1 ratio of substrate : water mentioned there is fine for spotted turtles). A winter cooling off period is sometimes, but not always, necessary to stimulate breeding activity. Hi! I had studied your artical and ready to build another tank for my sprtties. If I have further questions, I will ask you. Thanks for the kind words…I look forward to hearing about your progress. Just caught an eye on your blog and saw this Calabaria reinhardtii. What a beautiful snake indeed! One question though, we have a very similar looking snake in Namibia called “Cape Wolf Snake” Lycophidion capense, could it by any change be family or even Subfamily?! Nice to hear from you; I’m fine, thanks. I hope all is well with you and yours. Fall is coming on here, and I suppose spring is on its way there? The Cape Wolf Snake is a very interesting species that is not seen in zoos here at all. Right now it is classified as within the family Lamprophiidae within the superfamily Colubroidea; but the taxonomy of the group is not well studied and will probably change. 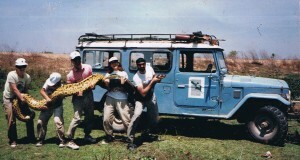 The group includes House Snakes as well as many less well-known species. You can see a full list of member species here; click on individual names for range and other info. Do you come across this snake; I’d enjoy any observations you might have when time permits. We do come accros this Wolf snake regulary, but I did not keep them to long as I realease them back into the garden, for the prey on small mice comming from the field. In captivity I fed them lizards which they enjoy very much! When prey is put in cage, they grab it with their mouth and in split seconds curls it in and suffocates it till movement has stopped(hence the question of family to the python). They can be kept easily but stay fairly aggressive. Unfortunately that is the only observation I can share. Thanxzzz many for the valuble link! Thanks for the interesting observation; first I can recall…so much to do and see! That site is usually up to date on latest taxonomy changes, I think you’ll find it useful. I have had the worst luck tracking down loxocemus bicolor in the pet trade. Any suggestions? Unfortunately, they are not bred regularly and only appear sporadically in the trade. Best to monitor dealers on kingsnake.com. Some suppliers will take requests, keep you on a waiting list, etc….worthwhile to ask.